Diffuse Reflection Lab's upstairs diorama. Lead Pencil Studio is the Seattle-based collaborative of Annie Han and Daniel Mihalyo, a couple who met in architecture school at the University of Oregon in 1991. During the course of the past 15 years, they have made a career designing site-specific installations that turn a critical eye on the built environment. Much of their work has focused on picking out aspects of the constructed world that are so ubiquitous or mundane as to be invisible to the casual observer, but are nonetheless sharp indicators of the temperature of our culture. They then present these telling, everyday features of modernity in sculptures and installations that encourage viewers to consider them with refreshed eyes. A fine example of this is Non-Sign II (2010), an asymmetrical assembly of stainless steel rods that frames in its negative space the form of a billboard. Commissioned by the U.S. Government, the sculpture sits along the highway near the U.S.-Canada border north of Seattle, a stretch of road particularly crowded with actual billboards advertising the variety of items on sale at the duty free vendors near the frontier. In contrast to the real signs, which draw drivers’ attentions away from the landscape, Non-Sign II frames the spectacular scenery of the Puget Sound, bringing the natural world back into prominence while at the same time calling out the vacuous inanity that so often defines advertising culture. Lead Pencil Studio’s latest essay in this vein is Diffuse Reflection Lab, on view until May 11 in the Vaulted Gallery of the Visual Arts Center at University of Texas at Austin. Diffuse is something of a smorgasbord think piece based on one central observation: that, while for most of history the built environment has been a largely matte affair, it is becoming increasingly reflective. Indeed, the profusion of metal, glass, and polymer cladding materials that accounts for the better half of modern construction has turned our commercial centers (especially in this country) into veritable funhouse halls of mirrors. Any stroller in a downtown district anywhere in America can, in addition to taking in the physical world around them, see that world reinterpreted in the shop windows, stainless steel column covers, polished brass plaques, glossy marble bank facades, and actual mirrors of the cityscape—buildings, cars, passersby, hotdog stands, pedigreed dogs, their own wondering faces, all captured with varying degrees of fidelity from warped and foggy to embarrassingly exact depending on the diffusiveness of the material whereon the scene is reflected. It’s a fun observation, and will no doubt give many a visitor to the exhibition a wry insiders satisfaction the next time they spy their hand reaching out for itself while they move to grasp the burnished handle of a department store’s door. The installation itself, however, is somewhat less fun. Assembled and constructed with the help of UT art and architecture students during the course of three and a half weeks, Diffuse has something of the slapdash air of the work of a sculpture student who slept too late and only started gluing their used toothbrushes to a hat rack the morning before their review. It makes up for this by offering many different takes on the idea of reflectivity in the modern world and—in classic Lead Pencil fashion—by creating a dialogue with the environs of the Vaulted Gallery. The installation responds to conditions within the Vaulted Gallery. 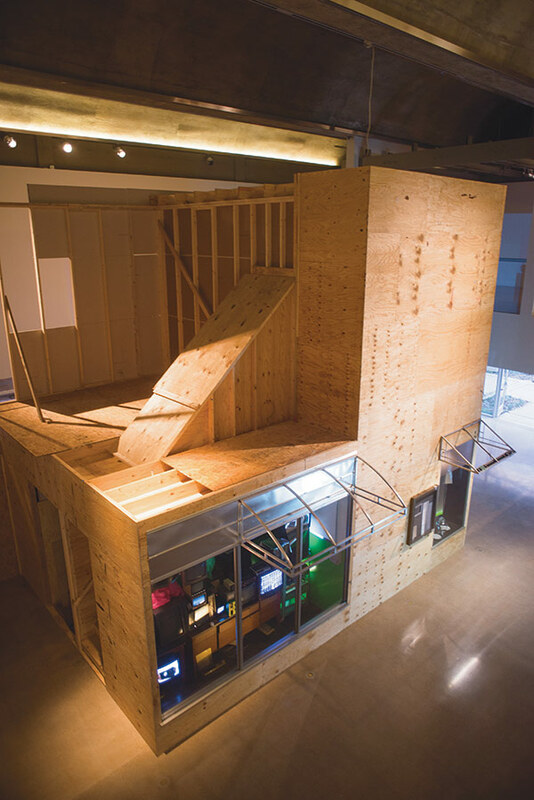 A two-story construction of timber framing and plywood, Diffuse sits within a double height space, its upper section visible from the second floor. The western face of the installation is pasted with a printed GigaPan (gigapixel panorama) photograph of the gallery’s western storefront, so you walk in and see what you just walked through. 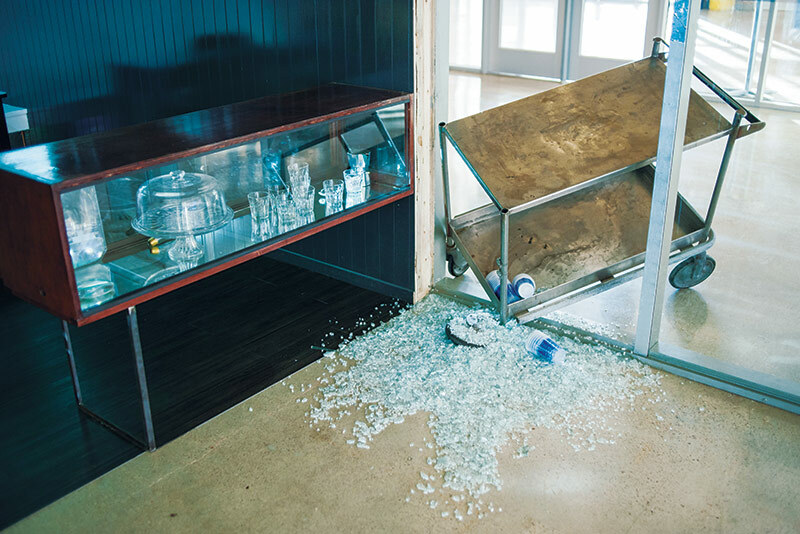 At the northern edge, where the photo ends, are two actual glass panels, one of which is shattered by an overturned dessert cart, representing a historical occurrence that took place at the gallery’s grand opening. The northern face responds to the adjacent courtyard—whose windows allow the powerful Texas sunlight into the gallery—with a café of sorts. Visitors can enter the café, take a load off on the chairs or banquette, and study the way daylight plays off the glass display cases and cake domes and butter dishes and such. In the eastern face is a diorama full of electronics, mostly lamps and television sets that play various feeds including—my personal favorite—the scrolling pictures of the reflective items that Lead Pencil purchased for the installation from craigslist, in each of which is reflected the world of the seller. Around the south end is yet another diorama, what Lead Pencil refers to as the “construction room,” an unfinished space that lets us know that the world is full of entropy. This room also features a TV showing a five-minute video, on a loop, of a reflection in a puddle. 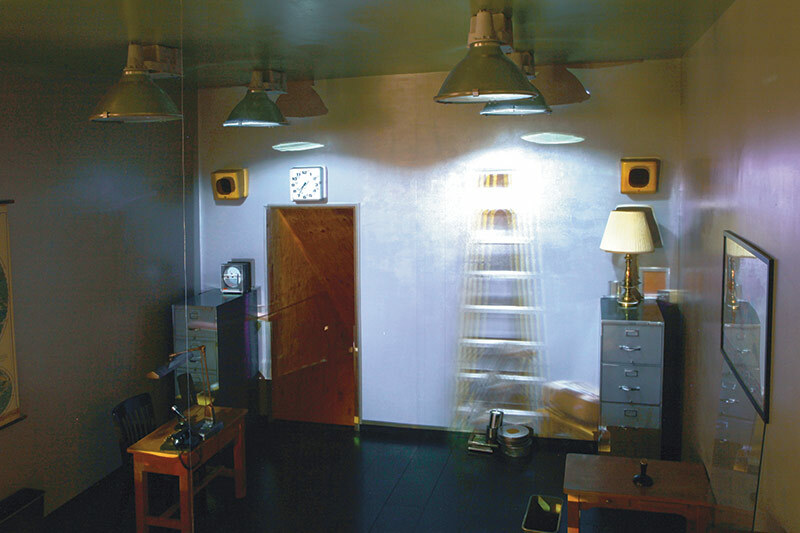 The final offering is upstairs on the western face: another diorama, this one of a room filled with office furniture and industrial light fixtures upon which is projected an image of the same room. The projected image moves in and out of phase with the actual room, creating an unsettling blurring effect. The best thing about Diffuse, as I hinted above, is the takeaway—what it might help you to notice about the world in which we live, if you get the message, or plow through the 90-page reader that accompanies the installation (which was not compiled by Lead Pencil, by the way). As a work of art itself, however, it is too diffused. It lacks the singularity of conception and execution seen in the collaborative’s best pieces, such as Non-Sign II, which are capable of conveying an idea, and setting a mood, in one immediately recognizable form. The Architectural League's Emerging Voices program, now in its 25th year, showcases the nation's most promising architectural talent. The eight firms picked by the Architectural League as this year's Emerging Voices are an eclectic group, representing the breadth of the profession. Their portfolios run from techno-savvy commercial work to modernist residences and sculptural installation art. We wanted to convey a broad cross-section of what young architects are doing in this country,, said juror Ali Tayar, principal of New Yorkkbased Parallel Design. I think [this year's winners] strike a balance between those doing architecture in a traditional wayywith a client, a site, a real buildinggand those doing conceptually driven work..
Wendy Evans Joseph, president of the board of directors at the Architectural League, observed, In some years, the winners are concentrated on one coast or specialize in one thing, but this year there was a tremendous range of talent with an emphasis on regional concerns.. Interestingly, most of this year's winners are foreign-born; perhaps it is their expatriate status that heightens their sensitivity toward their adopted contexts. 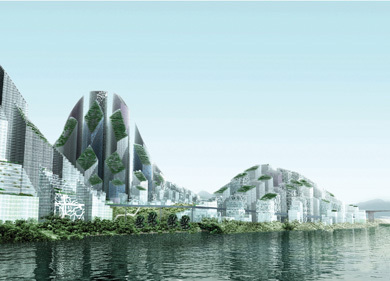 The 2006 Emerging Voices share another crucial characteristic: The common bond between the winners is the intensity of their explorations and the rigor of their work,, said juror Adam Yarinsky of New Yorkkbased Architectural Research Office (ARO). Also, given the nature of the series, we were looking for firms with a cohesive story to tell.. During the month-long lecture series that accompanies the honor, the eight firms will have a chance to present their distinct takes on contemporary practice. Lecture series sponsored by USM. Left: Escher GuneWardena's Jamie House is sited on a very steep hill in Pasadena, California. To maintain a modernist box, the architects lifted the house on a concrete platform to avoid having to mold it to the landscape. 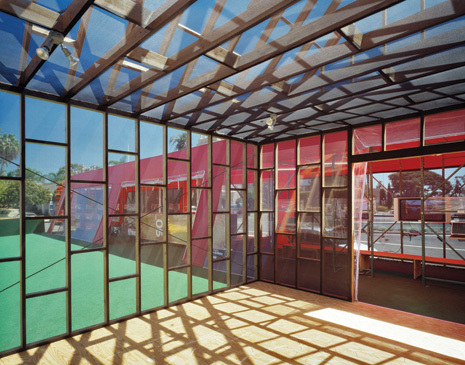 Right: In 2001, The firm used Electric Sun 1, a tanning salon in Los Angeles, as a chance to create kinetic light sculpturess that echo the nature of the business. Frank Escher and Ravi GuneWardena founded their firm in Los Angeles in 1995 and immediately began working on the Jamie House in Pasadena, an involved project that took five years to complete. The young firm was eager to take on smaller and less complicated commissions, and quickly built a portfolio that includes a series of tanning salons, a restaurant, and a gallery, all in their adopted home of Los Angeles. (Swiss-born Escher studied architecture at the Eidgennssische Technische Hochschule in Zurich and Sri Lankan GuneWardena received his degree at California State Polytechnic at Pomona, where they both currently teach.) They've only recently returned to residential work, with several projects now on the drawing board, including the construction of Dwell Home 2, the winner of an invited competition sponsored by Dwell magazine in 2004 to design a sustainable house for the Los Angeles area. The firm has also completed work on a number of high-profile existing buildings such as an addition to a Hollywood Hills house designed in 1959 by Richard Neutra and the restoration of John Lautner's Chemosphere in Los Angeles; Escher is the administrator of the John Lautner Archive in Los Angeles. We are primarily interested in coming up with what we believe is the simplest solution to a complex problem rather than making a formally complex solution,, said Escher. I like the idea of people reinterpreting history and not trying to reinvent the wheel. Their Jamie Residence in Los Angeles is reminiscent of the work of John Lautnerrit's a concrete and glass box that sits on big, straightforward concrete pylons. It reminds you of Lautner's materiality, and its strict geometry is very contemporary.. There is a conceptual dimension to EscherGunewardena that is compelling and seems to transcend the seemingly conventional nature of the projects. At first glance, the Jamie House might seem to be a contemporary take on a Case Study house, but I think there was another agenda here. There is a stereotype that everyone in California is dealing with everyday materials and casualness, but this house is more than that.. They were working within a very typically California condition, and so they embraced cantilevered outdoor spaces, clean, modern forms that both respond to and engage with the landscape.. Above: Cruz is designing new mixed-use developments based on the adaptive reuse of existing structures and recycled materials. The model above shows a proposal for a community in Tijuana. Below: He also designed a temporary pavilion and information center in San Diego for inSite_05, an initiative involving notprofits and cultural organizations that activates public space through guerilla installations in the Tijuana and San Diego area. this structure is in the process of being moved to Tijuana and converted into a residence. Teddy Cruz has built a practice around research and advocacy in the border territory between Tijuana and San Diego, where he has lived off and on since 1984. As the Guatemala-born architect noted, While my work is based on trans-border urbanisms, most of our projects have to do with housing typologies.. Through his research Cruz targets specific issues that inform the relationship between the two regions, with their sharply contrasting economies and cultures. Tijuana has built itself from the waste of San Diego, rising from debris like old tires and garage doors,, Cruz explained. He has worked closely with local nonprofits such as San Ysidroobased Casa Familiar to advocate the exploration of residential typologies that are suitable for new immigrants, as well as programs that would provide civic empowerment through micro-loans and other economic incentives. His work has earned him numerous awards, including a Rome Prize in 1991, two P/A Awards (2001 and 2004), and several AIA awards. He was recently given a tenured position in the U.C. San Diego's studio arts program. He's the only one addressing social concerns that remind me more of architecture in the first half of the 20th century, when architecture was trying to make a better world, not just interesting shapes. His community-based work requires some incredibly tedious analysis, but at the same time he uses it as a basis for creating visually interesting work.. In a way, there's a relationship in spirit between Cruz and Samuel Mockbee's Rural Studio, in that neither tries to apply a conventional notion of architecture to an unconventional situation. Rather, they see what the potential of the situation is. [Cruz's work] uses architecture as a frame for development.. I love that Teddy Cruz's work isn't just about developing its conceptual basissit's not one of those flippant, of-the-moment fads.. The Annie Street Residence, located in Austin, Texas, was finished in 2003 and soon after certified by the City of Austin's Green Building Program. The self-described design-build firm remained involved in all aspects of construction on the project, because, as principal Calvin Chen observed, There is no long tradition of craftsmanship in Texas; there are no cheap and good-quality contractors..
Calvin Chen and Thomas Bercy established Bercy Chen Studio in 1998, just after graduating from the University of Texas at Austin. They began by designing small residences, though the scale of their projects has been growing in step with their experience. Their methods, however, remain unchanged, according to principal Calvin Chen. We started as a design-build firm, a very hands-on operation,, he said. We always wanted to be involved with construction because we love the immediacy of the building site. We will always remain a design-build firm.. 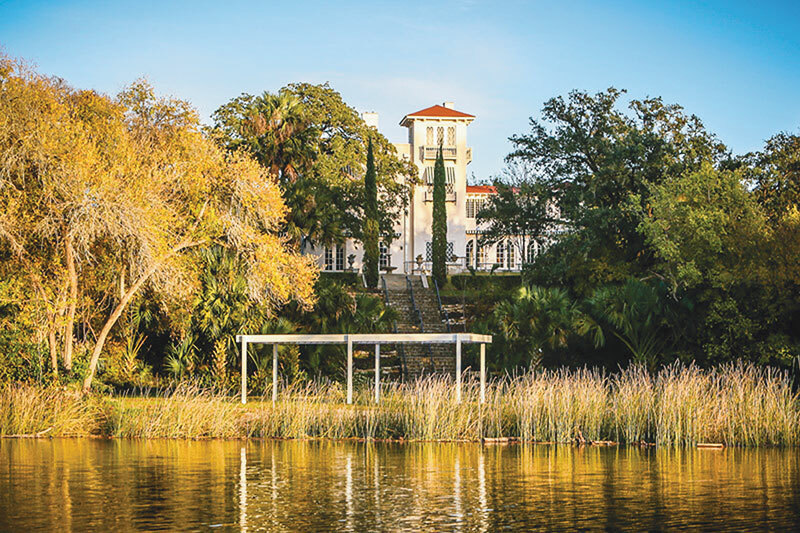 While the firm's work is mostly located in and around Austin, they have so far resisted what Chen describes as the quantity-over-quality Texas mindset. We want to produce work that's driven by ideas,, he said. They are currently working on a 100-unit condominium building in Austin and a resort near Mexico City. I feel as though Bercy Chen connects to the recent history of modernist architecture while bringing something fresh to it. Their Annie Residence is like the Eames House, but with something more..
Their buildings are comprised of volumetrically simple spaces, but light and color play into them. They play up reflections, colors, and textures, with surfaces ranging in quality and form. They're using a base type and manipulating it skillfully, into their own interpretation..
We wanted to acknowledge the rigor, intensity, and quality of the work from the standpoint of material, detail, form; it is highly resolved and very mature..
Left: In 2003, Studio GANG designed an installation for the National Building Museum's Masonry Variations exhibit. The firm devised a structural system that would support a curtain-like wall of thin stone tile, which was rear-lit to emphasize its delicacy. 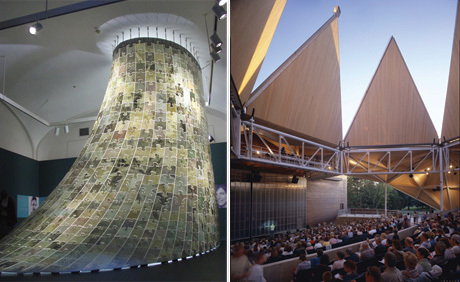 Right: Studio gang designed and built the outdoor Starlight Theater for Rock Valley College in Rockford, Illinois, over the course of three summers (2002204). It features a pitched roof with mechanically operable panels that open and close depending on the weather. After working as a senior designer at Booth Hansen Architects in Chicago and the Office of Metropolitan Architecture in Rotterdam, Jeanne Gang founded Studio GANG in 1997. According to Gang, who holds degrees from the University of Illinois and Harvard, Our firm is very research-driven and analytical. We begin with the constraints and criteria of each project, and try and find something of architectural interest.. Her projects demonstrate the desire to rework conventional approaches to materials and space. For the exhibition Masonry Variations at the National Building Museum in Washington, D.C., in 2003, Gang was asked to imagine the future of stone as an architectural building material. Her response (pictured) was to create a seemingly cloth-like curtain of 622 interlocked stone tiles, each cut down to 3/8-inch thickness and hung from the ceiling. I knew stone had to be made lighter in order to work in the future,, explained Gang. The project was only realized after extensive testing and experimentation. 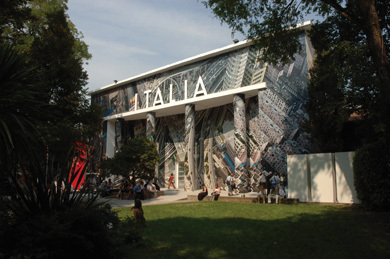 Studio GANG was featured in Architectural Record's Design Vanguard 2001 and the firm's work was featured in the exhibition at the U.S. pavilion, Transcending Type, at the 2004 Venice Architecture Biennale. It seems to me that Studio GANG is trying to respond in an ingenious and constructive way to varying contexts and trying to make things that do more than one thing. Their spaces have multiple purposes that work well over the seasons and over time, and become more animated as they age.. The installation she did for the National Building Museum was beautiful and inventive. 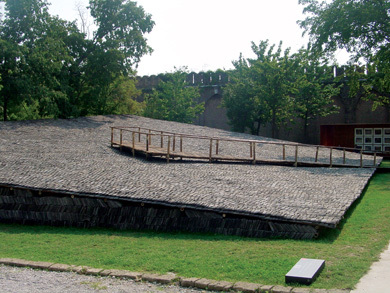 When you look at the installation, you don't connect the material, which is basically flat and hard, to a double-curved structure. The project was suggestive of skin and of architectureeit connected skin to structure..
Jeanne Gang has a very strong range of work and a unique ability to execute varying scales for varying niches in terms of program. Her craft extends from installations to large-scale projects, like her Starlight Theater. I love her emphasis on craft and skill..
Left: While at an artists' residency in Wendover, Utah, Han and Mihalyo made Cleft Footing (2000), an 8-footttall sculpture of tumbleweed collected from the region's arid landscape. 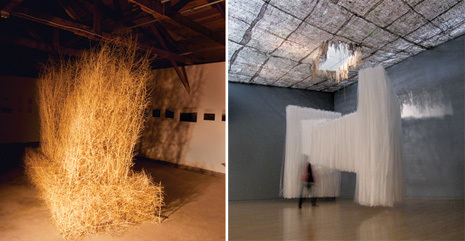 Right: Minus Space (2005), an installation at the Henry Art Gallery in Seattle, was comprised of two parts: The ceiling is made of a fibrous fabric from which a visqueen and plexiglas form hangs, via thin wires. Annie Han and Daniel Mihalyo met as students at the University of Oregon, where they both received their BArch degrees and where they also studied sculpture. After graduating from architecture school we kept a separate art/studio space. We both went through the whole trajectory of internships, entry-level office work, et cetera, but we always kept the art studio,, said Han, who was born in South Korea. In 1997, the two opened an independent office and began to design commercial spaces and residences, all the while continuing to work on installation projects. In 2000, Han and Mihalyo (a Washington native) won an artist's residency at the Center for Land Use Interpretation's Wendover, Utah, complex, where they were able to pursue sculptural landscape work. After that, the firm was invited to participate in other installations, including a group show at the Center of Contemporary Art in Seattle. Now, we do about half site-works and half architecture,, said Han. 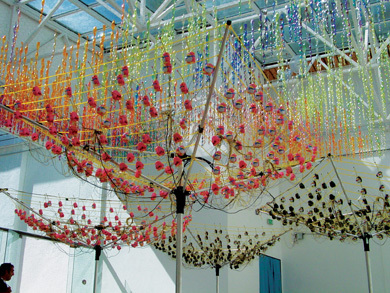 Their installations are environments that are fully architectural in their own right. While some of the site-specific projects are clearly meant for temporary occupation, you can easily imagine them becoming more permanent for specific clients. It's a very inventive body of work, elaborating on how we perceive things through space, light, color, and texture.. If we were going to honor people who did installations, for me it was important to recognize work that was connected to architecture, as opposed to work that veered only toward art. Lead Pencil Studio's installations clearly test architectural ideas.. They don't necessarily do conventional architecture, but are engaging architectural issues and issues of space and perception. Emerging Voices doesn't have to be defined singularly within the tradition of conventional architectural practice. 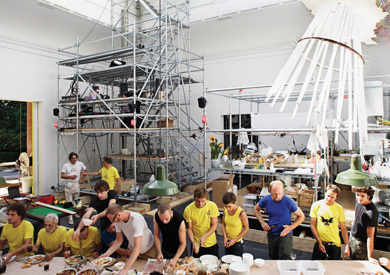 These kinds of practices can really bring the sensibility that we bring to our work to the perception and habitation of space..
Left: In 2004, George Yu designed Blow-Up for the SCI-Arc Gallery. 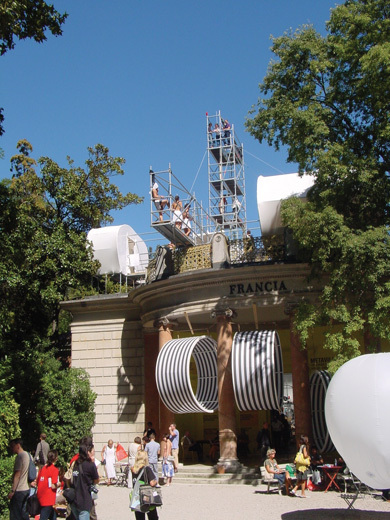 The installation used 17 inflatable vinyl bladders,, each 20 feet tall and 20 feet in diameter as sensors that would generate sound when activated by touch. Right: A workspace for Sony's Design Center, built in 2005, uses a white epoxy floor and pale plaster wall panels to create a bright and open environment. 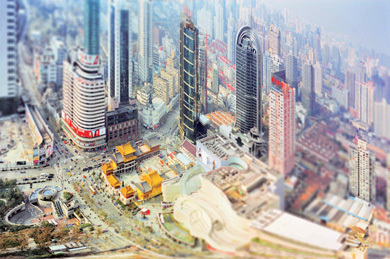 Hong Konggborn George Yu came to Los Angeles by way of Canada, where he received his Bachelor of Arts in Urban Geography at the University of British Columbia before going to UCLA for a graduate degree in architecture in 1985. Established in 1992, his office specializes in commercial architecture, which he uses as a point of departure to study the urban environment. Our goal is to use our projects as a form of research to ask questions about the nature of the building type they represent, and not just in a strictly formal and aesthetic sense,, Yu explained. For example, in Vancouver, malls are really interesting because they have gone from the conventional landlord/tenant model to a condo-type model where spaces are sold to retailers as property. I'm as interested in looking at leasing models as at architectural models.. While Yu's work shows a strong design sensitivity, his primary interests lie in the relationship between businesses and their environment, which he explores through integrating new technologies into his designs. For me, it seems that he's interested in thinking about projects from the bottom up. He uses work like the IBM business center as a way to rethink traditional formats. It's great to see architects wanting to question typologies, to give a project a form and organization and logic, and in his case, a very strong materiality. 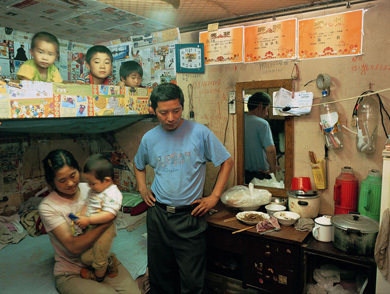 All of his projects are in one way or another about research: Some are on a programmatic level, some are on a tectonic level..
George Yu's work was shockingly new to me. His work is extensive, the quality is overwhelming, and what I found amazing is his range of scales. He represents a condition where someone can balance technology and invention with materiality and execution. Technology, more than anything, really becomes part of his projects..
Left: One of dECOi's few built projects, the Glaphyros apartment in Paris, completed in 2003, features an 8-by-6-foot aluminum screen whose form is based on a mathematically generated algorithm of three intersecting waves. Right: In 1996, dECOi designed a prototype residence for a Malaysian developer who wanted a project that was technologically advanced but not gadget-heavy. Each panel's dimensions, as well as their etched decorative ornamental patterns, were mathematically generated; no two are the same. London-born Mark Goulthorpe established his studio, dECOi, in 1991 in order to pursue a number of design competitions. His practice is now is dedicated to exploring new technologies through collaborations with professionals in other fields, such as mathematics and computer programming. dECOi's built work is largely composed of smaller residential projects and showrooms located primarily in France, Malaysia, and the UK. Of this year's Emerging Voices, Goulthorpe, who maintains offices in Paris and London, has the strongest international presence: In 2002 he designed the French Pavilion at the Venice Biennale and in 2001 he won Taiwan's FEIDAD international digital design competition. In addition to his practice, Goulthorpe is an associate professor at MIT, and divides his time between the School of Architecture and the Media Lab. I think he's one of the leaders of the digital design movement; he brings an incredible amount of expertise and craft to his work. His projects are facilitated by computation as a tool, which is crucial to both their fabrication and realization, and the result is masterful. One of the benefits of the digital revolution will be to re-empower architects as master builders. In a way, he represents a master digital builder. He's very craft-based but he uses the digital medium for fabrication all the while understanding what the local trades are doing. He is thinking through this whole array of tools that we have.. I appreciated the human condition Goulthorpe incorporates into his tech-based projects. He uses interactive and reactive devices like breathable materials and rainskins, i.e., surfaces that react to water..
Left: nArchitect's winning design for the Museum of Modern Art/P.S.1's 2004 Young Architects program formed bamboo into an undulating canopy; the material started out green and tanned over the course of the summer. Right: The 2006 Switch building, located in New York's Lower East Side, is the firm's first ground-up project; it is a seven-story condo-development with an art gallery on the first floor. Mimi Hoang, who was born in Saigon, and Eric Bunge, who was born in Montreal, met as graduate students at Harvard and formed nArchitects in 1999. They soon began winning design competitions, including the Museum of Modern Art/P.S. 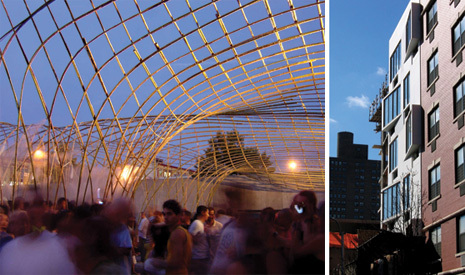 1's Young Architects Program in 2004, for which they created a massive arched bamboo canopy. It's the firm's largest installation to date, though they also did a sizable floor-piece at the Lehmann Maupin Gallery in New York (2000) and an interactive wall at Artists Space (2005). Both Bunge and Hoang teach (at Parsons and Yale respectively), and while their exhibition work is highly conceptual, their portfolio contains realized projects as well, including several interior renovations and a penthouse addition in lower Manhattan. Their largest project to date, the Switch building, a seven-story, ground-up residential lowrise in the Lower East Side, will be completed in September of this year. For a young firm, it's interesting that they are building. And they are doing so in ways that are driven by the specifics of each project. Their work is programmatic and conceptual at the same time. In their P.S. 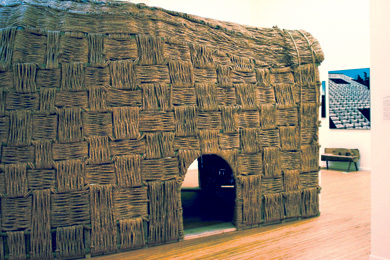 1 project, for example, they were thinking about a traditional material, bamboo, that has so much energy to it, but also it has sensory properties such as smell..
nArchitects represented, for me, a way of practicing architecture in New York. Here, you don't get to do a house till you're 45; architects tend to experiment longer and then when they do build, their ideas are fairly well worked out. Their bamboo structure for P. S. 1 reminded me of Frei Otto's timber lattice for the Mannheim Garden Exposition, which was also this orthogonal grid that distorted into warped planes. To me, it's interesting when people pick up ideas that others have left off, and take them further..
Their projects display inventiveness and an ability to define the terms of the project in an unexpected way. In the Switch building, the transformation of the outer surface creates a special element in each apartmenttthe bay windowwbut also changes the perception of the facade..